"Brilliant images, inspiring fantastic words"
"It's this beautiful book... I thought that's going to look lovely in the kitchen and it's [full of] really interesting facts about all types of ingredients." "History's never been so appetising!" "Expect this book to live on your coffee table for regular flicking-through sessions to tantalise and tease the taste buds." Includes a foreword by Giles Coren. Explore the rich stories, symbolism, and traditions that come wrapped up in the food on our plates - food that not only feeds our bodies but also makes up our culture. 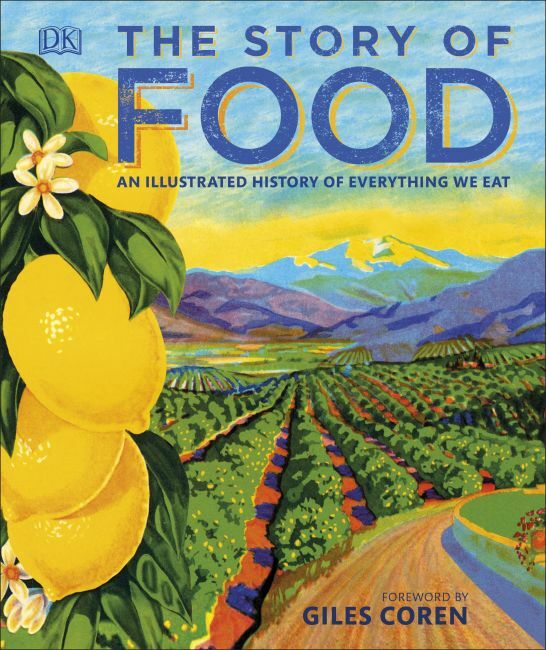 In The Story of Food; An Illustrated History of Everything We Eat our millennia-old relationship with nearly 200 foods - from nuts and seeds to noodles and meat - is sumptuously illustrated, with tales from all over the world. Food is the cornerstone of daily life, culture, and even religion. Staples like bread, rice, and salt are part of our culinary history, used in many ways all over the world. The Story of Food tells the extraordinary stories behind the foods we eat: from salt to sushi and rice to ravioli. It reveals, for example, that Pope Clement XIV was assassinated with poisoned drinking chocolate and tells the story of how coffee went being from a banned substance in some European countries to become the world's favourite hot drink. A true celebration of food in all its forms, this book explores the early efforts of humans in their quest for sustenance through the stories of individual foods. Covering all food types including nuts and grains, fruit and vegetables, meat and fish, and herbs and spices, this fascinating reference provides the facts on all aspects of a food's history. It explains how foods have become a part of our culture from their origins to how they are eaten and their place in world cuisine. The Story of Food is packed glorious images to create a feast for the eyes, while the stories intrigue, surprise, and enthrall. This is essential reference for every foodie.